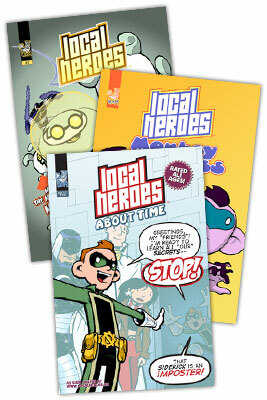 Now's your chance to buy all three Local Heroes books at once! With one purchase, you can catch up on the adventures of Squire, the powerless sidekick who struggles to keep up with his super-powered mentors. Buy Local Heroes #1, Local Heroes: Monkey Business, and Local Heroes: About Time for $8.00 (save $1.00 of the normal price), plus shipping and handling.